For some, it takes some time to get the hang of it; just be patient and try to relax. Also, make sure your phone brightness is set to maximum and that you are in a somewhat darkened environment. 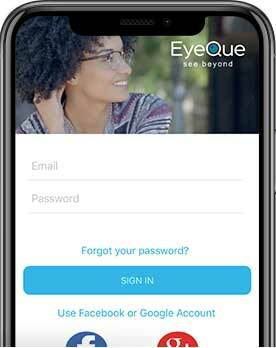 The EyeQue logo on the miniscope must be facing the bottom of your smartphone. You can turn on the alignment aid using the toggle button located slgihtly above and between the eye icons. Looking through the miniscope, with the alignment aid on will product two visible rings (one green and one red), in addition to the parallel lines used for testing. 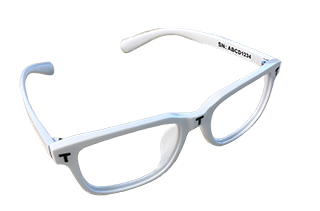 The last tip that we can give you is to move the the miniscope's eye cup so that it touches your nose. Depending on which eye you are testing, slowly move the miniscope to the right (right eye) or left (left eye) until both lines are clearly visible. When the two lines are visible stop and slowly cover the miniscope your testing eye. Try to maintain the position of miniscope as you cover it as best as possible. This should give you the clearest view of the two lines within the miniscope.